Meeting macaca-gate's central anti-Allen catalyst | Jon Katz, P.C. I kept my composure when encountering such excellent and accomplished people as Lou Jacobi (through a storefront window), Geoffrey Holder (on a SoHo street), and Madeline Kahn (in the audience of Aunt Dan and Lemon). A rare group of people leave me awestruck. Tears welled in my eyes when I met McCoy Tyner, who made musical and cultural history with John Coltrane. When with Jun Yasuda, I try my best to restrain myself from doing a full questionography of her life. When Pramoedya Ananta Toer strolled into Olson’s Books, I pinched myself. Shekar Ramanuja Sidarth has joined that group that leaves me awestruck. He is an accidental mini-celebrity who contributed to George Allen’s downfall by merely being present to lead Allen to blunder into Macaca-gate. I met Sidarth, as he calls himself, for the first time, today, as he was filing something for the law firm he works at, as he continues his second year of George Washington Law School. The descriptions of him as a low-key man who apparently does not seek the limelight seem accurate. At first, Sidarth seemed so low-key that I wasn’t sure how he would respond to a request for a photo together. 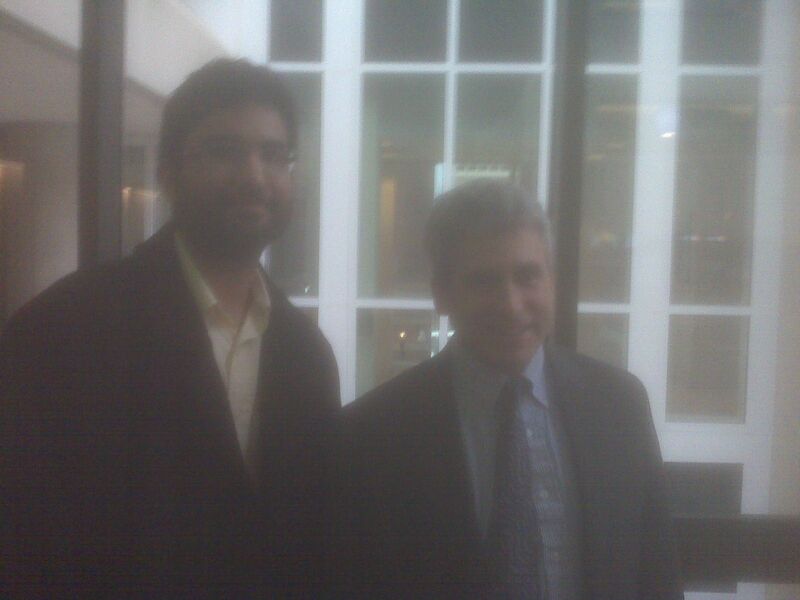 But then I remarked how he was accustomed to training the camera on Allen during his failed re-election campaign, and he seemed happy to accept my request for a photo, which turned out to be rather fuzzy in the courthouse’s dark cafae area, with my cellphone. Where Sidarth was an accidental catalyst to Allen’s downfall, Mike Stark sought to get Allen’s goat during the campaign, got tackled by some goons who were either present to support Allen or possibly were asked by his campaign to provide security or order, and helped further the unravelling of Allen’s reelection bid. Sidarth told me he knows Stark. On Jeopardy two months ago, Sidarth told Alex Trebeck about going on a religious pilgrimage with his mother to Tibet. Although I am not crazy either way about Jim Webb, who defeated Allen, I think an Allen reelection would have been much worse. Sidarth wrote a great piece a few days after Allen’s defeat, turning an ugly situation into an inspiring look forward.